Praise for PDX Clean King! “There are a number of things to say about the PDX Clean King Team. 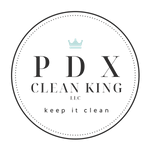 Predominantly, PDX Clean King is a young company who provides excellent service with quality of care to their customers. I’ve known them since they first began their company, and they always extend the extra step to do an even better job than expected. Holland Rule of PDX Clean King works efficiently and thoroughly, completing every job with professionalism and friendliness, a combination that is very hard to find these days.